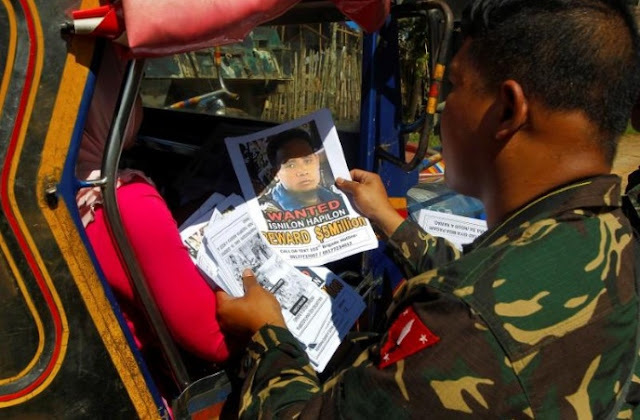 FILE PHOTO: Soldiers distribute pictures of a member of extremist group Abu Sayyaf Isnilon Hapilon, who has a U.S. government bounty of $5 million for his capture, in Butig, Lanao del Sur in southern Philippines February 1, 2017. MANILA - The Philippine armed forces said on Monday that unconfirmed battlefield reports indicate the military had killed two leaders of the pro-Islamic State alliance holed up in a southern city for nearly five months. Isnilon Hapilon, the anointed “emir” of Islamic State in Southeast Asia, and Omarkhayam Maute, one of two brothers at the helm of the militant alliance, may have been killed in a battle to retake Marawi City, but the authorities still needed confirmation, said Colonel Edgard Arevalo, a military spokesman. “We have received field reports stating that Isnilon Hapilon and Omarkhayam Maute are dead. But we cannot issue any official statement yet pending the confirmation of such report,” he said in a text message to reporters. The deaths of two key rebel leaders, if confirmed, would be a major boost for the military, which has been criticized for its slow progress in retaking Marawi, the country’s only Muslim majority city. The leaders have been central to the rebels regrouping, re-arming and recruiting after previous clashes over the past two years on the southern island of Mindanao. Another leader, Abdullah Maute, was reported by the army to have been killed in August, though no body was found to prove his death. The military has several times reported the possible deaths of the leaders, their escape, or presence in the Marawi battle zone, but has not had solid proof. The rebel alliance is comprised of fighters from the Maute group, Abu Sayyaf, and aided by foreigners from countries that include Malaysia, Indonesia, Singapore, and some Middle East states. Child soldiers and teenagers are among the gunmen. The ease at which the rebels took control of Marawi and their ability to endure more than 130 days of air strikes, has caused fears in the Philippines and the region that Islamic State’s radical ideology and its advanced recruitment methods are more prevalent than was previously imagined. The clashes have killed 813 rebels, 47 civilians and 162 military since insurgents seized the heart of Marawi on May 23, according to the Philippine government. The Philippine armed forces said on Monday that unconfirmed battlefield reports indicate the military had killed two leaders of the pro-Islamic State alliance holed up in a southern city for nearly five months.